It's pretty safe to say that when thinking back to school shopping or "in need of a room upgrade" shopping, Target comes to mind. It's impossible on a normal shopping trip to leave without spending under $100, but come B-T-S season, the glittery folders (who cares that I already graduated?? ), stylish room accents and floral desk calendars make finding something (or five million something-s) easier than ever. While Target may be the center of all things dorm room/back to school goodness, a LOT of their pieces can double as home/apartment must haves too. You know you're craving a Target trip; here's some must haves to check out whether you're shopping for the new semester or just need an upgrade at home! 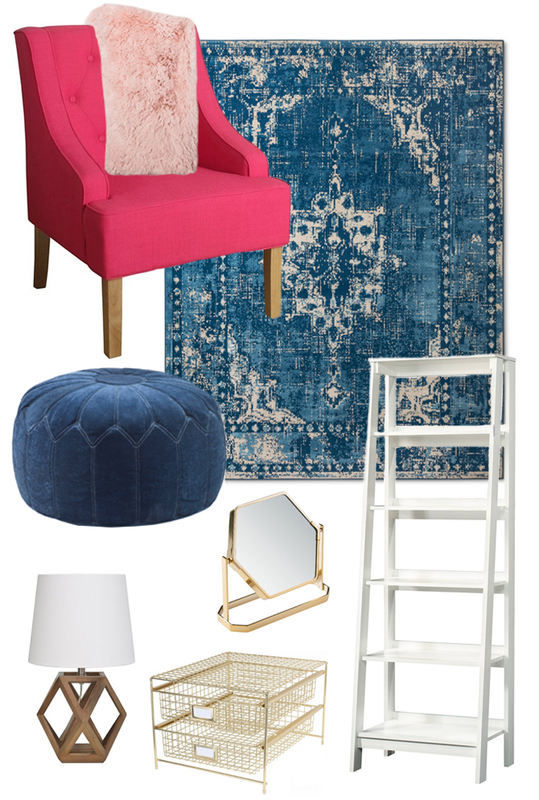 Pink Accent Chair ($197): I'm a firm believer that every room needs a good accent chair! But really, I just believe that because we all need extra space to store clothes, shopping bags and clean laundry - are we all in agreement?! Haha we all have "the chair"! You can get an extra 15% off right now with code AUGUST - it also comes in 6 other colors if bright pink isn't your thing, but it's a perfect statement piece! Blush Throw Blanket ($17.99): is there such thing as owning too many throw blankets...? I don't believe the limit exists, and if it does, I've definitely exceeded it. ;) Target has soo many incredibly soft blankets, and whether you use this to cuddle up with at home, in your dorm or in your apartment, it's under $20 and a total must have for year-round use. Navy Dyed Rug ($44.99): this rug comes in a pink version and a black and it *just* went on sale for $39.99! It looks like a super expensive rug you'd buy from a rug warehouse yet it's under $50! There's a couple of sizes and the pattern and look of it is super classy. Blue Ottoman Pouf ($119): these are arguably the funnest home decor pieces EVER! It's great because it doesn't take up a lot of space and you can use it in nearly every room in your home. It's worth the price - and it's also part of that 15% off sale! Gold Bathroom Mirror ($18.99): there's an entire gold bathroom collection and set that goes with this mirror, but I LOVE it for a vanity maybe even more! Or a night stand, bookshelf, dresser, dorm room, apartment... never ending possibilities. It's the perfect size! Wood Accent Lamp ($33): there's something about having a wooden accent piece... especially with this navy/pink and gold theme! It's so different than any other accent lamp I've seen before. Gold Wire Storage Baskets ($24.99): have you ever gone into Target and walked out without a bag of goodies for your desk/office space? If you have, can you teach me how you did it? Because I'm pretty sure it's impossible! These baskets are the perfect way to store loose papers and things you need to access on the daily, but don't want to leave laying around. White Wood Bookshelves ($69.99): PSA. Here are all of your IKEA/Pinterest room goals tied into one, $70 bookshelf unit! It comes in white and black and it's sturdy, compact and gives tons of space to decorate your little heart out. In LOVE! I need that mirror, the storage baskets and that lamp in my life! Basically anything good haha. Great picks! That chair and that rug are everything!!! I am LOVING that navy rug! I hope to have my home office in white with accents of navy, gold and perhaps a blush shade. These picks are so chic and perfect for a home office or dorm! Love that rug! Kind of obsessed with that pink chair! *heart eyes* Also those gold baskets would be perfect for my room! Okay I need that chair in my life like immediately. I am going to be doing an office makeover, this chair and those gold baskets would really fit in well. Might need the pink throw too as the office gets chilly in the winter! Oh, fun, love these shopping ideas. I love that Target has extended their decor section! I love that pink chair! I just bought that lamp today at target!! It's so cute! I'll take one of everything please!!! I loveeeee target home decor, literally can't get enough! Such great picks!! I am loving that little blue seat so cute. Oh that pink chair- love! I'm going to be taking a trip to Target soon because I'm moving into a new apartment with my fiancé. I can't wait to dive in to home decor! I love the pink chair & the gold pieces as well. Gold goes well w/my space. Ah, I just love Target! They have such a great assortment and items to meet practically every styles! Omg I seriously almost bought that wire desk basket! I'm redoing my desk space and Target has the cutest accessories! I love home decor from Target! It's all so pretty! I can't wait to start decorating my new place! I love accent chairs, but I've never owned any. I love the selection they have at World Market. There's this yellow one I've had my eye on for way too long. Target always has great home decor! You really can't beat their prices either! THAT GOLD MIRROR THO. All the heart eyes!!! Um, ok. I am SERIOUSLY obsessed with that pink chair. SO fun! That rug is so gorgeous! I love it paired with pink! That lamp is so cool! Love it. I could totally see it in my bedroom along with that rug.